A good and comprehensive media database is the most important feature of a press release distribution service because it ensures that press releases go exactly to the right people and publications, when they are also more likely to be published. Liana Technologies has its own team dedicated to building, updating and maintaining our media database. The team makes sure that our database is always up to date. Updating a media database is mostly manual labor since automations are not precise or efficient enough for this purpose. The goal is to keep the media database relevant at all times and therefore working at it daily is important. ”Contacts are mainly found on a media outlet's own website, which for some countries like Finland is easy, but not all countries' media channels give out journalists' contact info as publicly. Therefore, a big part of this work is calling or messaging media outlets to get current contact information”, she continues. Media database work also depends on the country a lot. For example, in Finland the media field and relationships with journalists are so good that often journalists themselves contact our information specialist team if they leave their job, for instance, or want to change their category. In Finland journalist surveys are also conducted regularly in order to update the journalists' contact info. Pinky Fong works with the Asian media database from Hong Kong and she utilizes other sources besides digital ones in her work. She goes to libraries and local cafes regularly to read the newspapers and magazines and search for reliable reporters. Pinky Fong works with the Asian media database in Hong Kong. ”Printed magazines and newspapers are usually a good source for finding contact info in Asia. Some papers give out the journalists' emails right under the article, which makes my job a lot easier”, Fong states. Region-specific differences can also be notable in Asia. 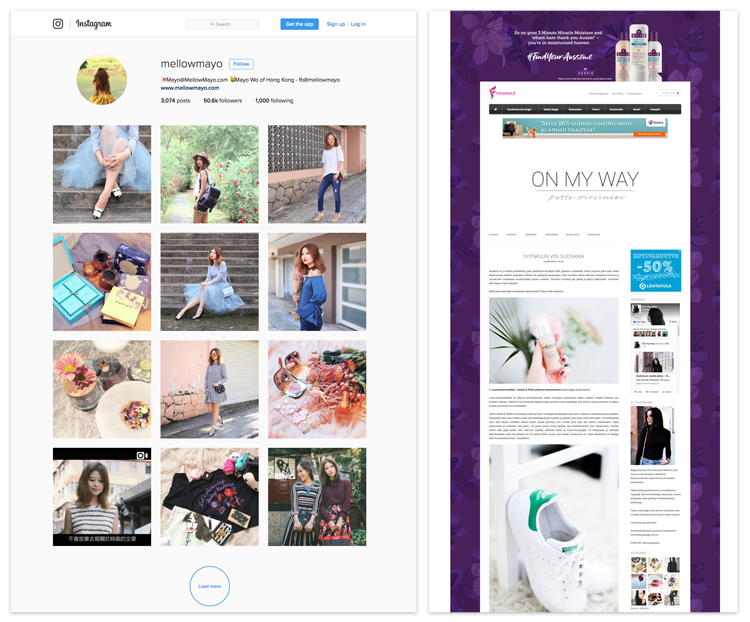 For example, social media bloggers on Instagram or Facebook are often more prominent in the Hong Kong area, while traditional blogs are used more in the Taiwan area. It pays off to know the media field of your target country well. Image: Whereas in Finland and Taiwan blogs are a big deal, in Hong Kong many of the most popular bloggers have moved into social media almost completely and abandoned the traditional blog platform. Language skills and cultural knowledge are essential in building media databases. The person in charge for each area has to master this particular area's languages and cultures well enough, usually at a native level, so that our media databases are always kept as high-quality as possible. In addition to adding new contacts, the database is continuously gone through to comb out old, inactive, and invalid contacts. The area and publication affect how often the contacts are being revised – the turnover of reporters in some media channels is more frequent than in others, so the contacts of these publications are checked more often. ”Addresses are gone through every day so that our customers have as much updated info about media representatives as possible. If there is a project in sight that involves sending press releases to a certain group of journalists, special attention is paid to updating these contacts”, explains Hilla Mikkonen who is in charge of the Swedish media database. Maintenance also includes monitoring the press releases. LianaPress reports show which journalists are most active in opening press releases and from these reports you can also follow which topics gather most interest from publications and journalists. Reporters that haven't opened press releases in a long time, however, are most likely inactive and their contact info and current working situation should be checked. Image: The statistics in LianaPress help you to find the most active readers and clickers. ”You should also always make sure that a certain journalist has written articles recently because parental leaves, for example, don't always show or are not updated on the general contact info page of the medium”, Mikkonen clarifies. Our media database includes noted bloggers in addition to newspapers, radio, and other media. The number of bloggers depends on the industry but, for example, travel, food and fashion bloggers are nowadays a very important part of efficient communications. You can use media monitoring services and social media to find bloggers and opinion leaders. It's important that the writer is active and is in it for the long haul – that's why brand new blogs are usually not added to the database, but are first followed for a while. Many journalists are active in social media as well, so especially by following the PR hashtags on Twitter and LinkedIn you can find good, high-quality contacts. Also following media channels that in turn follow changes happening in other media – for example, nomination news and portals – makes finding journalists and updating contact information easier. ”I use social media services, like Facebook, Instagram and LinkedIn to find contact information and follow reporters. I also utilize other web services and portals that offer journalist contacts”, Pinky Fong clarifies. The media world lives in constant bustle of change, so the big challenge in maintaining a media database is keeping it sufficiently up to date. Media outlets are born and die constantly, new publications supersede old ones and setting up a blog is so easy that new blogs appear in heaps daily. ”In Hong Kong people change occupations often and this alone creates challenges. Especially in the media industry, outdated media outlets are discontinued and new ones take their places. That's why monitoring and updating a media database continuously is especially important in Hong Kong”, Pinky Fong explains. The rapid changes in the media industry mean that a media database can never be perfect. However, working with it daily ensures that we always offer our customers the best service when it comes to media contacts. LianaPress is a multi-channel press release distribution service and its media database is maintained with daily updates by information specialists. If you need assistance in publishing and distributing your press releases, contact us and let's make a plan specifically for your public relations needs! Veera is a Visual Marketing Specialist at Liana Technologies. She is fond of everything having to do with design: from photography to graphic design and illustration. In her free time, Veera enjoys doing yoga, working out at the gym and gaming. You can connect with her on LinkedIn.